This is my unit study review for the Schoolhouse Review Crew from The Old Schoolhouse Magazine called WannaBe ™ -When I Grow Up I Want to be a Firefighter. I started the unit study last week with both of my boys, my youngest was home from school on the 4th due to it being Staff Day/Election Day, so I thought it was the perfect day. My oldest wanted to be a firefighter when he was younger, but I think most kids want to after they see the big red truck with the loud sirens blaring. To begin I printed out both copies of the book so they could each have one, I could just read off of my Ipad. Next I handed them out and then we began to take turns reading the paragraphs. We would stop and discuss each question or picture that we came across. 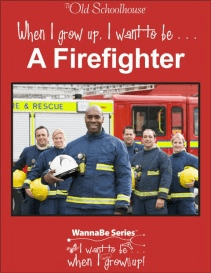 I thought this book was very interesting with all the graphs to show how much they have a chance of making depending on where they live, the levels of the career, and what type of things that they need to know in order to apply to be a firefighter. Personally I liked the book myself. It tells about a typical day in the life of a firefighter. The reason it is called a firehouse is because they are there for 24 hours, so they are pretty much living there. They sleep and eat there as well, so someone is in charge of household chores like cleaning and cooking for everyone else. I did agree with the boys though, it was pretty long, but might be better to do in a week or two. I decided to do it the one day where they were both home, so it was a little overwhelming. The book includes all of the four subjects; Science, Math, Social Studies/History, and English. It comes with a writing prompt page, fill in the blank, a crossword puzzle, and a word search. Each of the pages weren’t very hard to fill out as long as they pay attention. I did let them look back since this was the first one we have done and since it was so long, kind of hard to remember all of it. The book also includes definitions and all the answers are in the back just incase. It includes extra websites to check out incase you want to further the learning. I think the only thing you will need is a copy printed out per child, a pencil per child, and some colored pencils or crayons, your choice. I hope you will check it out and enjoy it as much as we did! We JUST went to the local firehouse last month for our homeschool co-op field trip. This would have been perfect to do beforehand. I will have to keep this in mind when I am planning out my curriculum for next year, so we can learn about firefighters and then take another field trip. This year I think my kids might have been too young for this, they are only 4 and 6, but maybe next year, when they are 5 and 7, it will be better. Thanks for the review! I remember trips to the fire station with my kids… always a great lesson theme. Sounds like a great book for kids (or anyone else interesting in becoming a firefighter) to read!